The compact design of the SENTRON 3VL circuit breakers coupled with excellent characteristics fulfills the high demands of today's electrical distribution systems. These circuit breakers offer a broad product range, improved technology, space savings and easy operation. They are available both in thermal-magnetic (16 A to 630 A) and in solid-state versions (63 A to 1600 A). Disconnector units with features for stopping and switching off in an emergency (main control switches and EMERGENCY-STOP switches) in conjunction with lockable rotary operating mechanisms and terminal covers. The overload and short-circuit releases are designed for the protection of cables, leads and non-motor loads. The overload and short-circuit releases are designed for optimized protection and direct starting of three-phase rotary current/squirrel-cage motors. The circuit breakers for motor protection are susceptible to phase failure and feature an adjustable trip class. The overcurrent releases operate with a microprocessor. These circuit breakers are used both for short-circuit protection as well as for isolating functions, which may be required in starter combinations consisting of circuit breakers, overload relays and motor contactors. These circuit breakers exclusively feature adjustable, instantaneous short-circuit releases. 4. 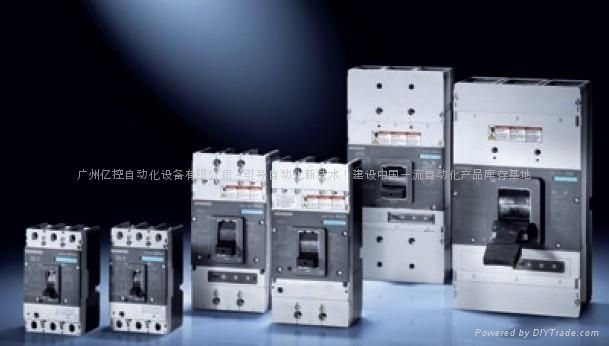 As non-automatic air circuit breakers (in 3- and 4-pole versions) These circuit breakers can be used as feeder circuit breakers, main control switches or non-automatic circuit breakers without overload protection. They incorporate an integrated short-circuit self-protection system, eliminating the need for back-up fuses. DIN VDE 0660, Part 101. Isolating features to IEC 60947-2, EN 60947-2. Disconnecting features (main control switches) according to EN 60204 and DIN VDE 0113. The SENTRON 3VL circuit breakers comply in addition with requirements for "disconnector units with features for stopping and switching off in an emergency" (EMERGENCY-STOP switches) in conjunction with lockable rotary operating mechanisms (red-yellow) and terminal covers. Please contact Siemens for details of other standards. VL160X to VL400 circuit breakers can be equipped with a SENTRON 3VL RCD module. They then comply with IEC 60947-2 Appendix B. The SENTRON 3VL RCD module complies with IEC 61000-4-2 to 61000-4-6, IEC 61000-4-11 and EN 55011, Class B (equivalent to CISPR 11) with regard to electromagnetic compatibility. The SENTRON 3VL circuit breakers are designed for operation in enclosed areas. Suitable enclosures must be provided for operation in areas with severe ambient conditions (such as dust, caustic vapors, hazardous gases). The RCD module is designed for retrofitting to the switch. It can also be retrofitted by the customer. The combination of SENTRON 3VL circuit breaker and RCD module can be fed from the top or bottom. All SENTRON 3VL circuit breakers with RCD modules are available with auxiliary switches, alarm switches, undervoltage and shunt releases. Protection of plant and equipment against overload or damage by ground faults (ground-fault protection). The RCD module trips the circuit breaker through vectorial summation current formation for all phase currents if the vectorial sum of the currents in the poles (= the ground fault current) overshoots the pre-set response and delay time values. AC currents and pulsating DC currents are measured (CBR, design A to DIN EN 60947-2). 1) Connecting terminal plate for flexible busbar; not for 690 V AC/600 V DC. 3) Circular conductor terminal also available.